This report, which summarizes findings from four case studies of Runaway and Homeless Youth Program grantees serving lesbian, gay, bisexual, transgender, and questioning youth, benefited from the contributions of many people. The case studies were conducted by Mathematica Policy Research and its subcontractor, the Williams Institute, under contract to the Office of the Assistant Secretary for Planning and Evaluation (ASPE) in the U.S. Department of Health and Human Services (HHS) and the Office for Planning, Research and Evaluation (OPRE) in HHS’s Administration for Children and Families (ACF). The study would not have been possible without the support and cooperation we received from staff at all levels in each of the study sites. In addition to being extremely generous with their time while we were visiting each agency, staff responded to various follow-up questions. We are grateful for their participation. At ASPE and OPRE, Laura Radel, Seth Chamberlain, Sarah Sattelmeyer, and Akbar Hossain provided insightful guidance and comments during study planning, data collection, and reporting. In the early stages of the project, Sarah Oberlander and Kelsey McCoy offered helpful direction and feedback. We also benefited from input on study plans and assistance contacting study sites from Curtis Porter and Telisa Burt at ACF’s Family and Youth Services Bureau. Gregory Lewis of the True Colors Fund and Andre Wade of the National Alliance to End Homelessness offered feedback on study topics and site selection. 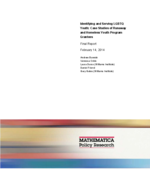 At Mathematica, Diane Herz provided thoughtful comments on drafts of discussion guides and study reports. Jane Nelson and Jill Miller provided expert word processing and production support. We would like to thank all these individuals and organizations for their contributions to the study.